The HubSpot Visualforce window displays a summary of the interactions a Salesforce lead or contact has had in HubSpot. The window shows details such as form submissions, marketing email sends, HubSpot Score, and includes a link to their HubSpot contact record. In the left sidebar menu, navigate to Build > Customize > Leads or Contacts > Page Layouts. On the left of a page layout name, click Edit. 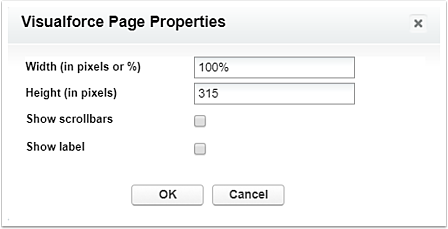 Please note: if you have multiple page layouts, you must add the Visualforce window to each page layout you want to display the window on. Click the Section item in the toolbar and drag and drop it into the desired location on the page layout. In the dialog box, enter a Section Name (e.g., HubSpot Information). Under Layout, select 1-Column. Click OK. In the toolbar's left sidebar menu, select Visualforce Pages. Click the HubSpot Lead Intelligence or HubSpot Contact Intelligence item in the toolbar and drag and drop it into the newly-created section on the page layout. Hover over the new HubSpot Lead Intelligence or HubSpot Contact Intelligence Visualforce window and click the wrench icon in the top right. 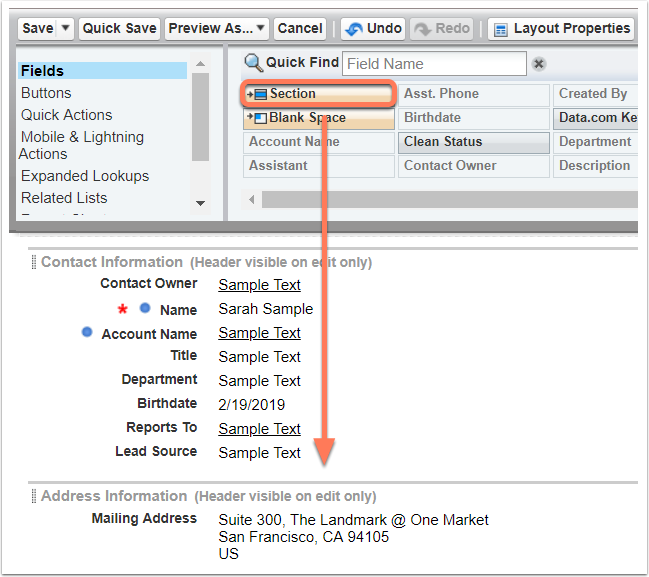 In the dialog box, change the window Height to 315, then click OK.
Navigate to a Salesforce lead or contact record to view the HubSpot Visualforce window. 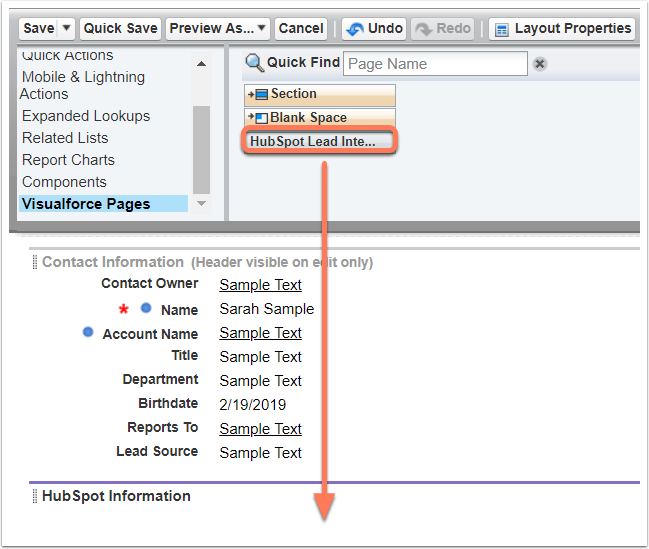 Repeat these steps for any other lead or contact page layouts you want to add the HubSpot Visualforce window to. In the list of objects, click Lead or Contact. Click the name of a page layout. Navigate to a Salesforce lead or contact record and click the Details tab to view the HubSpot Visualforce window.